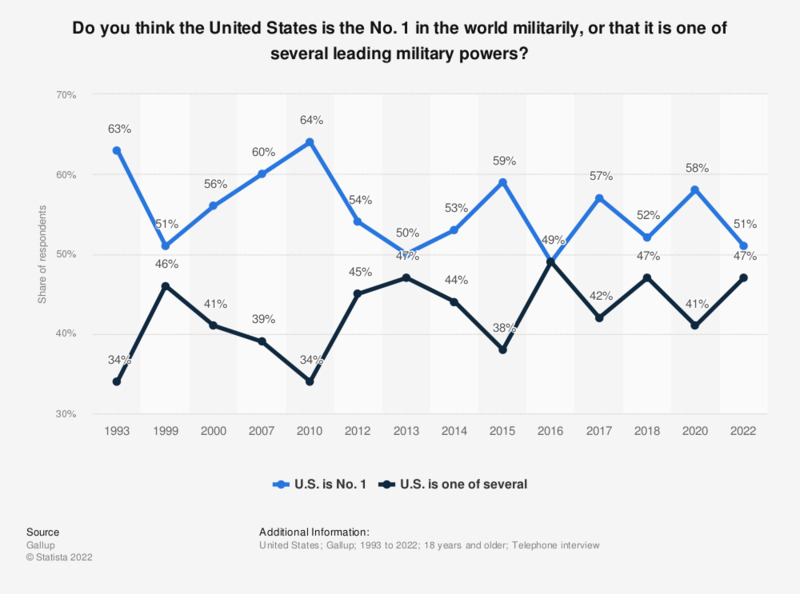 This survey shows the opinion of U.S. Americans on the U.S. being the No.1 military power in the world from 1993 to 2018. In 2018, around 52 percent of the respondents considered the U.S. the number one military power in the world, while 47 percent said that the U.S. is one of several powers. Please state your level of agreement to the following point: China's growing military power is a threat to the national security of the United States. Will China eventually supersede the USA as the leading global power? Do you think reports of sexual assaults committed by military personnel represent individual acts of misconduct, or do they represent underlying problems with military culture? Do you think the issue of sexual assault in the military is an important issue?